I awakened to a harsh reality on Sep 14, 1974, the day we were to play Pakistan in the Asian Games hockey final. It seemed I was on test. Why should everyone encourage me to play my best only now - and why only me? And then it dawned on me. 27 years after independence, I was to be the first Muslim hockey player to be played against Pakistan. eheran was my first Asian Games, and my third tour abroad with the Indian team. I prayed that I would be played this time at least. My prayers did not go unanswered like they were at Singapore and Munich, and I was played at Teheran. We won against Malaysia, a match in which I scored on a penalty corner. In the semi-final, the Japanese made me feel like a school boy playing his first big league match. The entire team was of the same size, same build, same weight and the same stamina. They played with an aggressive dedication, as player upon player would swoop to capture the ball. Like the bombers at Pearl Harbour, Tora!, Tora!, Tora! seemed to be their creed on the playground as well. Every Japanese player seemed like any other Japanese player, and I found it difficult to determine whether it was a forward coming in, or a half-back, or a full-back. We eventually defeated Japan on our way to the final. I awakened to a harsh reality on 14th September, 1974, the day we were to play Pakistan in the Asian Games hockey final. Coach Balkrishan woke me up and asked me to go out and have some fresh air as we were playing Pakistan. Even the great Claudius, who was the manager of the team, encouraged me to play my best and score a goal. It seemed I was on test. I heard everybody encourage me till I could bear it no more. What the heck, I asked myself. Pakistan is like any other team in the world. Why should everyone encourage me to play my best only now - and why only me? And then it dawned on me. 27 years and 1 month after independence, I was to be the first Muslim hockey player to be played against Pakistan. I was flattered by the honour, but the responsibility made me nervous. On my performance depended the future of Muslim players in the Indian team. My palms were sweating as I entered the number one field at the Aryamehr Sports Complex. The Asian Games village and the stadium were perched at an high altitude, which made breathing difficult. The Pakistanis played a lovely game, setting a blistering pace. Samiullah on the left and Islahuddin on the right flank excelled each other. The short passing of the Pakistanis were timed to the second, and we just could not find our feet at all. Ajitpal Singh played a captain's game. He was here, there, everywhere, checking, hitting, feeding and even obstructing to keep the Pakistani forwards at bay. Ajitpal has always been a friend and an inspiration, and on that day, it was he who brought out the best in me. Inside-left Shahnaz Sheikh is one of the all-time greats of world hockey. That day, I bottled up Shahnaz successfully, but was feeling very uncomfortable. I noticed that this great player was foaming at the mouth because of the strain that he was undergoing. Like me. Pakistan got two penalty strokes in succession. 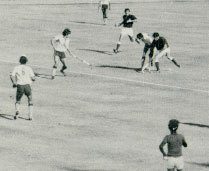 Goalkeeper Leslie Fernandes saved the first stroke of centre-half Akhtar Rasool. However, Akhtar got the better of Leslie in the second penalty stroke, and Pakistan was one up. We put everything we had into the game. The full-backs moved to the half position, and the halves pushed the forwards ahead. The counter attack turned fast and speedy. Left-back Surjit passed the ball to right-half Virender, who passed to centre-half Ajitpal, who went up to the 25-yard line before passing to Kusha. The centre-forward made his way to the Pakistani circle, and just when Kusha was about to score, Munawwar Zaman obstructed him. Ajitpal Singh made no mistake with the resulting penalty stroke, and the game was tied. The tournament was played on a round robin basis. After the final match, India and Pakistan had the same number of points. In a replay of the final, Manzoor and Munawwar converted penalty corners and Pakistan won 2-0.